"This disc presents a double debut. In offering the first recording of Britten's Sinfonia da Requiem, it introduces to the repertoire of the phonograph an important early work of one of today's most acclaimed composers. Moreover, this release marks Andre Previn's first recording as a conductor of symphonic music. Mr. Previn, still in his early thirties, is widely known as a composer and arranger of film scores, with two Academy Awards to his credit. Yet unlike many film composers whose musical horizons are wholly bounded by Hollywood, Andrew Previn has maintained his bonds with the greater traditions of classical music both as a concert pianist and as a composer. In recent years, he has also devoted increasing time to conducting and has appeared on the podium of virtually every major symphony orchestra in the United States. The present disc results from a guest engagement of Mr. Previn's in St. Louis, which drew such enthusiastic comment that Columbia Records decided to perpetuate the performance with this recording. The two living composers represented on this record have one attribute in common. Each embodies the music essence of his country. 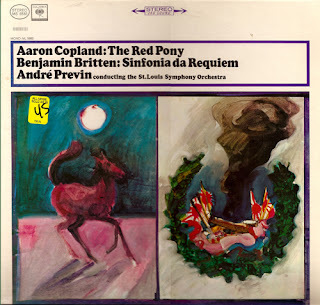 To the ears of this generation, Copland signifies America's musical idiom while Britten's work is audibly rooted in the soil of Purcell, the Elizabethan madrigalists, and the English oratorio. Both Britten and Copland, for philosophic reasons, might conceivably resent being labeled as "nationalist" composers. But today they are undeniably the musical representatives of their respective countries in much the same sense as Rimsky-Korksakoff and Borodin projected the musical character of Russia in the last century or Dvorak's and Smetana's music spoke explicitly of Bohemia. The flavor of the land is in there work. 1. Morning On The Ranch: A fanfare-like opening suggests daybreak in a land of vast, open horizons. The tempo quickens with the bustle of the morning chores. The fanfare theme returns as the sun stands high in the sky. 2. The Gift: A tender, dreamlike passage suggests Jody's hushed gratitude as his father tells him that the new pony is to be his own. For a while, Jody and the pony caper about jubilantly. Then the horse is quietly led back to its stable. 3. Dream March And Circus Music: Deep in daydreams, Jody imagines himself astride his steed, leading an army of knights. Yet in Jody's mind, the procession of the armored warriors sounds rather like a parade of cowboys. Next, Jody pictures himself as a circus-master, whip-cracking his pony around the ring. The circus band - like those Jody has heard in nearby towns - plays woefully off-tune. 4. Walk To The Bunkhouse: Billy Buck, an old cow-hand at the ranch, is Jody's special pal. They swap laconic comments as they amble over to the bunkhouse while the bassoon, bass fiddles and bass clarinet punctuates the lopsided rhythm of the cowboy's gait. 5. Grandfather's Story: Jody's grandfather reminisces about the old days when he led a wagon train "clear across the plains to the coast." 6. Happy Ending: The last movement of the suite is a sprightly reprise of the folk-like themes of the opening section. It logically serves as a musical finale but is unconnected with the plot of Steinbeck's story, in which Jody gains early maturity by learning to accept the death of his pony through illness. The Red Pony typifies all the elements that are widely recognized as being distinctly American in Copland's style. Some of the thematic material derives from such homegrown forms of music as the hoedown and the hymns of various American sects. His rhythms sparkle with a syncopated vitality clearly influenced by jazz. There is a nostalgic, open-air feeling about Copland's harmonies, and even his lyric flights retain a cool sharpness through the glint of dissonance. Britten's Sinfonia da Requiem has a strange history. In 1940, the composer received a rather mysterious inquiry from a high cultural official of the British government: Would he be willing to write a special symphony for a celebration in honor of a foreign ruler? Britten saw no objection as long as the work would not be expected to contain any jingoism or other forms of national blatancy. Eventually it turned out that the commission for this special music had come from Japan. The new symphony was to be part of the festivities marking the 2,600th anniversary of the founding of a present Japanese dynasty, which had been established in 660 B.C. by the emperor Jimmu Tenno. In 1940, Japan was embroiled in a long and cruel war against China, and Britten, a lifelong pacifist, accepted the commission with the idea of finding some way of speaking his conscience through his music. In choosing three sections of the Requiem - the Mass for the Dead - as titles for the symphony's three movements, he hoped to evoke a sense of terror at the ghastliness of war. His outline, when first submitted to the Japanese authorities, was readily approved. But when the score was completed, it nearly resulted in an international incident. The Japanese sent a furious note to England through the Japanese embassy in London, protesting that the young English composer had insulted the Mikado by submitting a work based on Christian principles and liturgy. With the help of his friend, the poet W.H. Auden, Britten drafted a suitable reply for dispatch to Japan. Yet there was no further word from the Japanese. Soon after, bombs fell on Pearl Harbor and all communications were severed. Britten's Sinfonia da Requiem, as an individual artist's plea for peace, thus casts a sad and ironic sidelight on the dark history of our war-ridden era. The opening movement of the work - Lacrymosa - is heavy with grief and ominous with foreboding. It is followed by an agitated, acerbic movement - Dies Irae - depicting the desperate turmoil and anguish that is the wrath of God. The symphony closes on a quiet lament - Requiem Aeternam - imploring eternal rest for the dead. The three movements are played without interruption. That was a lot of typing, but it helps visualize the music. Enjoy the record.